vCAC 6.0 was announced in Tuesday’s General Session and it’s expected to be generally available in mid-November 2013. For me, this is the most exciting announcement to come out of VMworld Europe. It’s all about building, deploying and managing application catalogs. vCAC installation has historically been a bit of a pig. 5.2 has its own pre-requisite checker and a number of hoops to jump through to get it up and running. Jonathan Medd even recently produced a superb PowerShell script to automate the setup of the pre-requisites. With 6.0 however, vCAC is being partially released as a virtual appliance by being broken down into several components. The IaaS (.NET) core is still hosted on Windows but the Self-Service portal and Application Director (see below) components are virtual appliances. The portal appliance includes a full instance of vCO. On the face of it, deploying vCAC may seem more involved but having some key functionality hosted in virtual appliances is a sensible move in my opinion. There is now going to be greater integration with (vFabric) Application Director and the latter will actually be bundled with vCAC 6.0 although it will be distributed as a separate appliance. The point of this is to allow organisations to define and build applications (blueprints) in Application Director and then manage deployment and infrastructure through vCAC. There’s a lab available in the Hands-on-Labs that showcases the vCAC 6.0 beta. Try it out. I swapped my TrainSignal subscription over to Pluralsight over the weekend. Following the acquisition of TrainSignal last month, integration of their courseware into Pluralsight has moved along very quickly. As well as providing TrainSignal subscribers with access to Pluralsight’s catalog of courses, the iOS app provides a piece of functionality that I’ve been waiting for – offline viewing on my iPad. Hooray! I had nearly 3 weeks off for a fantastic holiday with my family starting in late May. 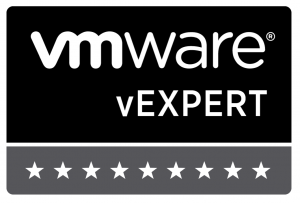 I barely looked at twitter or email for the majority of that time except to find out if I made the list of vExperts for 2013. I was involved in “a bit of a bump” that wrote off / totalled our car and have been a little distracted by insurance etc since. A lot of people in my family have birthdays in June. My daughter for one – it’s not every day your eldest turns 7. I decided that the time was right for a change of employer. No, you didn’t imagine it. I am changing employer. I will shortly be joining Xtravirt (thus changing their vExpert:Employee ratio). My time with Virtual Clarity has been brilliant. They’re fantastic people with whom I’ve learned a lot and for whom I have a great deal of respect. Thank you. Google Reader RIP, Should I Care? Yesterday, Google announced that as of July 1st 2013 they are retiring the Google Reader service. It was one of several stories that caused some bloating of my twitter timeline as scores of people that I follow picked up on it. My initial reaction was not a good one. I started using Google Reader only a few years ago but it has become a trusted and valuable way for me to consume information and news from the industry that I work in. Its absence will have a considerable impact on my daily activities. Having slept on it though, I’m certainly a lot more relaxed about it. Yes, it’s going to have an impact but have Google actually just provided me with a catalyst to change the way that I consume information? I mean, I could easily just swap to using another service. Feedly, for example, even have processes in place to allow you to migrate from Google Reader (something that may have contributed to their site being incredibly slow last night after the Google announcement broke). But does Googles decision point towards a trend of moving away from RSS? What then is the alternative way of reading updates from the various sites and feeds that I have been following? I don’t have a clear answer to any of these questions just yet but I’m going to be thinking about alternatives now. In the short term, moving my collection of feeds to another service seems to be the logical thing to do. After all, that’s one of the benefits of cloud services – portability. It will only be the work of a few minutes and I can carry on reading my RSS feeds on any of my devices beyond the end of June. It’s that time again. For the last few years Eric Siebert, over at vsphere-land.com, has organised a vote giving you, the readers of virtualization blogs, the opportunity to decide which you think is the best. Jeremy and I run this site in our spare time because we want to but if you could see you way clear to voting for us, or any of you other favourite virtualization blogs, then you have our thanks. Just hit the “vote” button to the left to be directed to the voting page, or click here.